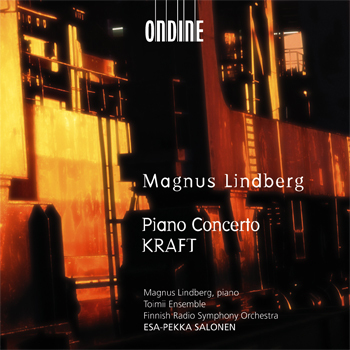 Lindberg here plays his own Piano Concerto, a substantial half-hour work that is both beguiling and dazzling where Kraft is mean and moody. If rhythm drives that earlier work, here the overriding mantra is harmony, in all sorts of weird and wonderful guises, from spectral to new-romantic. Again, there is no disputing the authority of the performance, expertly balanced by the Ondine engineers. (...) the precence of an impressive talent is vividly on display here, and you won't find more persuasive interpretations. Watch an interview with Magnus Lindberg on KRAFT on YouTube. This CD features Esa-Pekka Salonen and the Finnish Radio Symphony Orchestra with two major important works by Finnish composer Magnus Lindberg. The composer himself plays the solo part in the Piano Concerto (1990-94). The large-scale orchestral piece KRAFT (1983-85) features the Toimii Ensemble, in which Lindberg plays piano and percussion. This group was founded by Lindberg and Salonen in 1981 and has provided the composer with a laboratory for his sonic development. KRAFT meant for Lindberg the compositional breakthrough and earned him the UNESCO rostrum in 1986 and the Nordic Music Prize in 1988. Magnus Lindberg here performs on piano as a member of the Tomii Ensemble.